WO WEEKS AGO, I attended the NPM National Convention in Washington, D.C. Despite some of the odd liturgical theatrics that have been hogging all the headlines since then, I found it to be an optimistic experience. 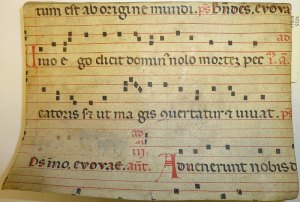 What makes me most hopeful for the future of American liturgical music was the renewed interest in the antiphons, from the basic “What are these antiphons in the new Missal?” questions being answered, to the closer looks at musical settings. There is a long way to go in our renewal, but even ten years ago ignorance of the very existence of these things we call antiphons would have been the norm. What makes the renewed interest even more hopeful is that the publishers are getting on board with this movement, publishing several new settings of antiphons that I was able to browse while I was there. Normally, this kind of commercialization annoys me, but in this case I think it is a good thing. It shows that the publishers, too, are coming along for the ride. Maybe it’s because the interest is so new, or maybe because it’s the logical place to begin, but I noticed that I have 30 or more vernacular settings of the propers for Advent, but I can count on one hand how many settings of the 25th Sunday in Ordinary Time I have seen. Many composers start with Advent, since it is the beginning of the year, or with one of the seasons, but few ever even get to the ordinal Sundays of the Year. They’re free, and they include all Sundays of the three-year liturgical cycle, with accompaniments and practice recordings. They are compatible with the Gregorian Communios of the Gradual, and can be used in conjunction with them or singularly as Communion processionals. Have a look, and use some new music, with texts assigned by the Church, during these Dog Days of Ordinary Time.